The first core of basement rock was brought on deck yesterday! There was a lot of anticipation, as we heard the infamous, "Core on deck" announcement; the scientists gathered on the core deck to see the first rock core of the expedition. The petrologists and mineralogists were especially looking forward to the moment. It turned out that there was very little recovery in the core but that is not startling since the average rate of recovery is low compared to sediment cores. Two cores were brought up during the night and had a much better recovery. 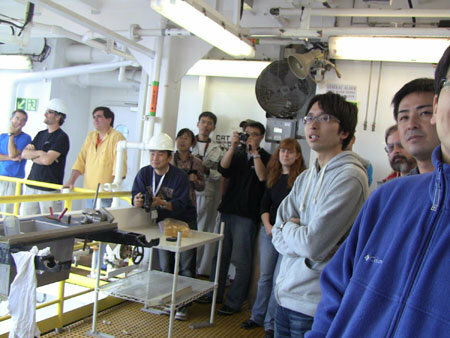 The cores were rushed to the refrigerator room after arriving on the core deck since some of the microbiologists are interested in them, also. The objective is to drill down to about 171 m into the basement rock. Some of the scientists are interested in sampling the core in areas where fractures are present. The fractures will most likely be filled with mineral material. Others are interested in alteration patterns, where the basalt has been changed by hot fluids. Take a look at the interesting fracture pattern in the core liner when the first core came up (bottom photo)!